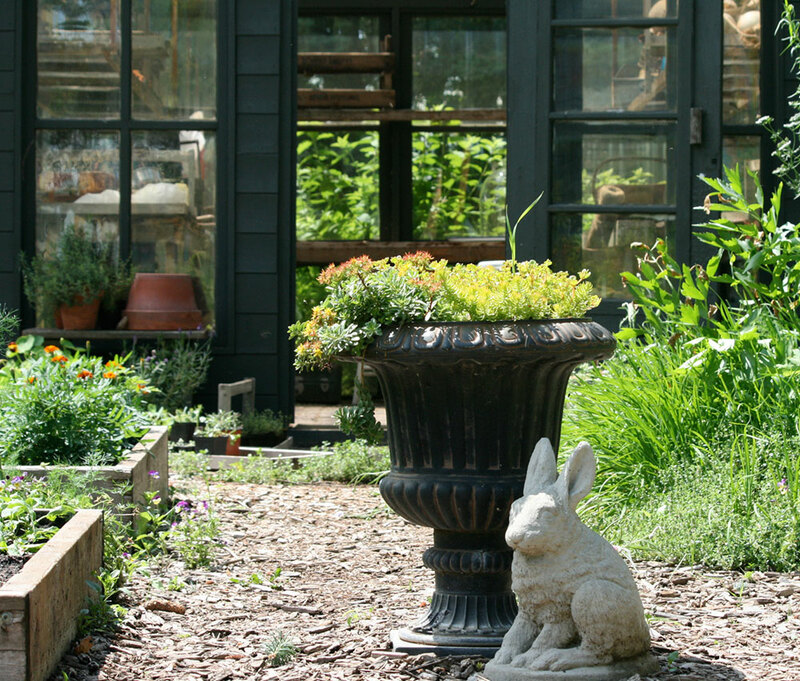 Most gardeners dream of adding a greenhouse to their garden space, and for good reason. 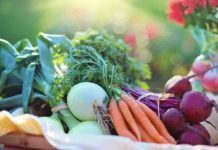 Greenhouses are ideal for starting seeds early in the year, for extending the growing season in cold climates, and for the beauty they bring to a property. 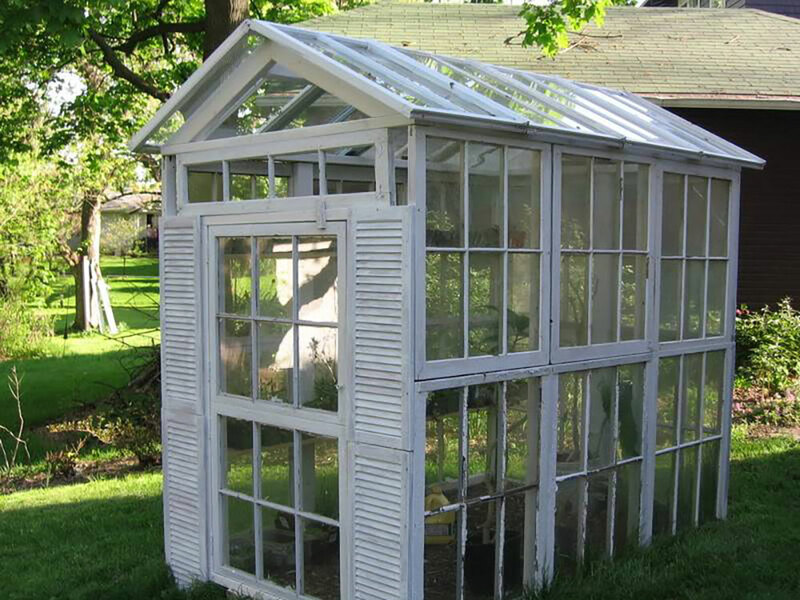 Greenhouses can be costly to build, however, which leaves many DIYers looking for inexpensive alternatives. 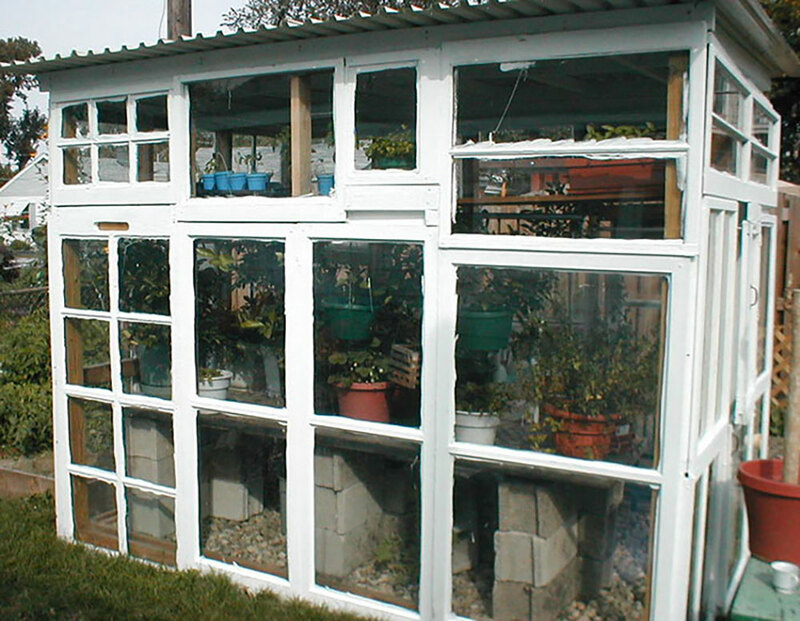 One way to cut costs when building a greenhouse is to use as many recycled materials as possible. Glass and polycarbonate panels are the most expensive components in a greenhouse. Fortunately, old windows are abundant just about everywhere and can be found for cheap or free with some searching. 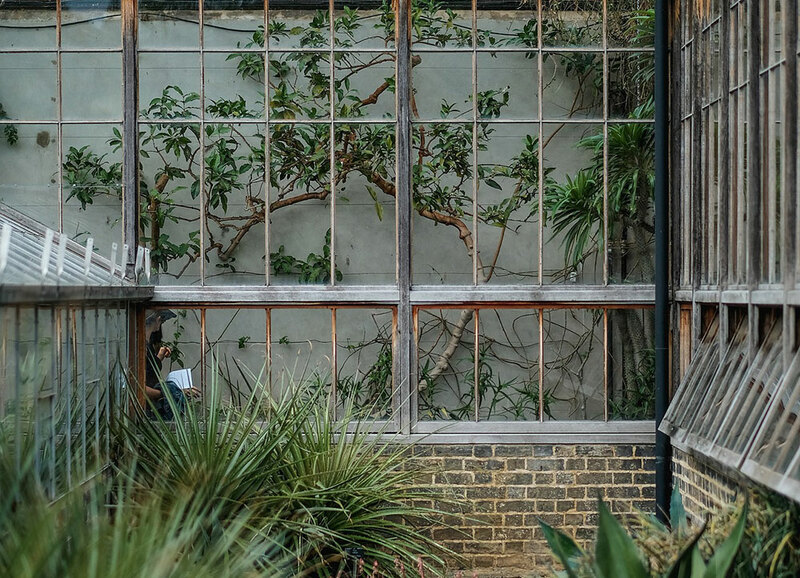 When you consider how many glass windows and doors are disposed of every time a building is torn down or remodeled, it makes perfect sense to seek some out and reuse them in your greenhouse. Want to see how other people are doing it? 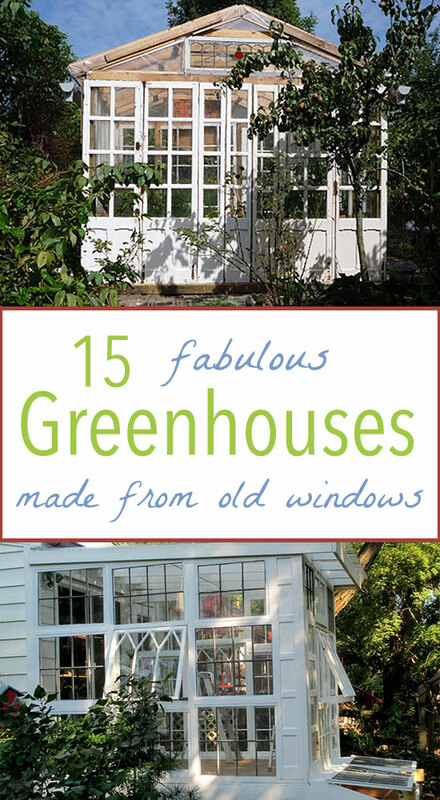 Here are 15 fabulous DIY greenhouses made using old windows. This homeowner salvaged old windows and doors from neighbors who were replacing theirs. She built her own trusses and painted the wood and window frames blue before putting everything together. Her husband and son assisted in the framing and window installation, and the result is absolutely beautiful. 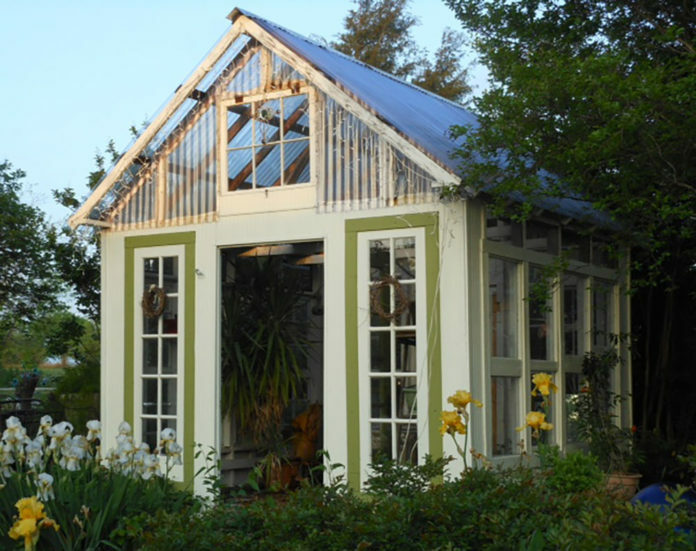 One of my favorite greenhouses made from recycled windows is this one, which we featured in an earlier article. 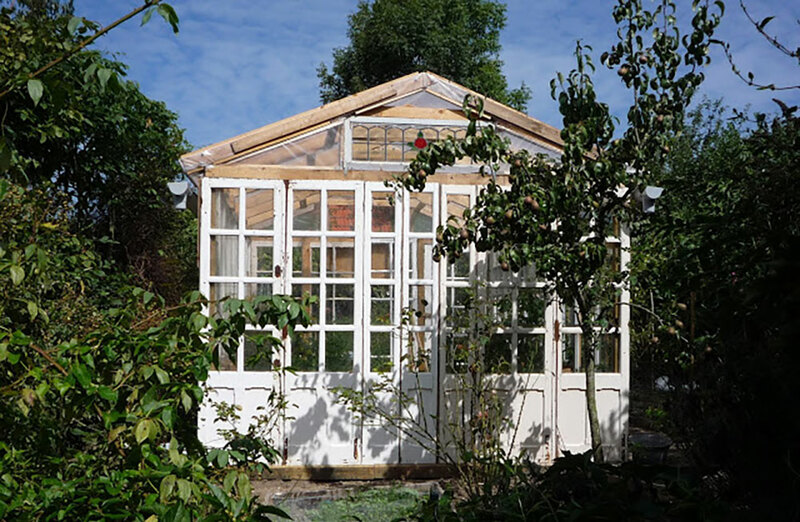 This couple used reclaimed windows and wood pallets to build a functional and practical greenhouse. It is the centerpiece in their garden and is used to grow flowers and climbing vegetables, overwinter annuals, and even serves as a shelter for their chickens and quail. Not too shabby, huh? 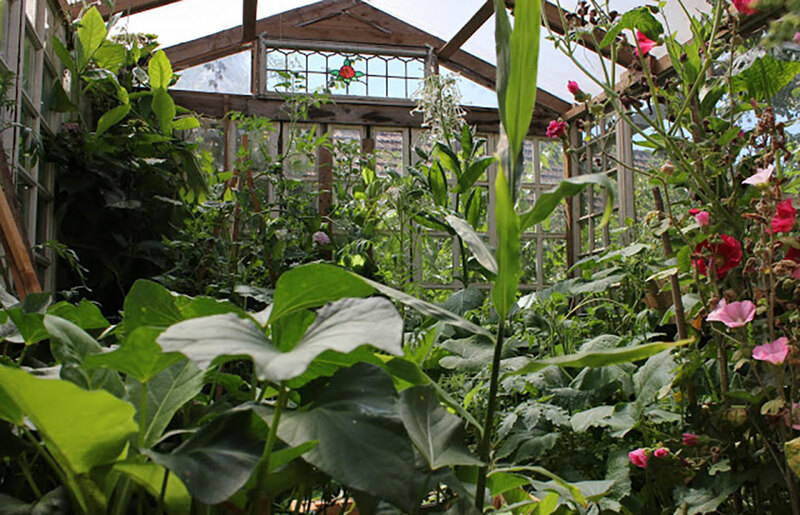 This greenhouse – built by the husband and wife team at Vaughan House – is the envy of many greenhouse dreamers! It is absolutely beautiful. It is used to house plants, of course, but also for photo shoots and as a rentable wedding and event venue. The frame consists of cedar beams, and old wood-framed windows make up the walls. Read more about the build process here. 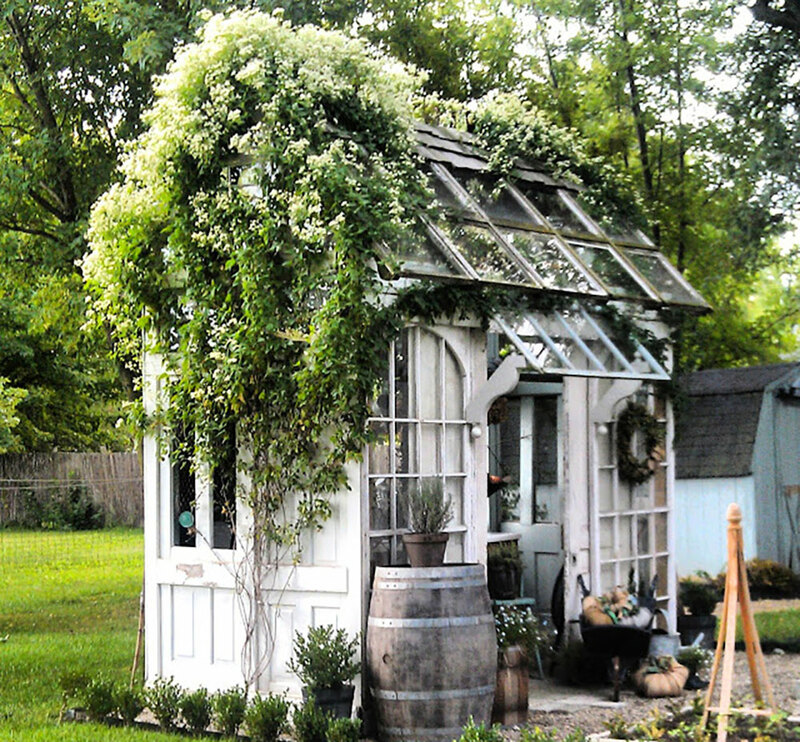 Using old windows found on Craigslist, a couple in Tennessee built this beautiful greenhouse that is also used as a potting shed. Since the windows are not all the same size, it took some planning to get the pieces to fit together, much like putting together a puzzle. 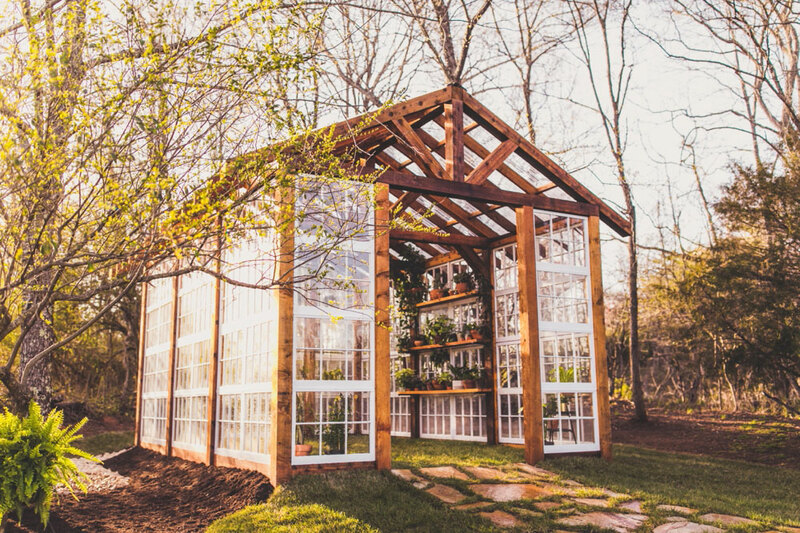 After collecting over two dozen antique windows, Christina from After Dinner Design put them together in this chic greenhouse build. She and her husband used recycled finds for the interior of the greenhouse, including the sink and an old farmhouse table. This entire project is upcycled inspiration! This little gem, named Tinkerhouse, sits in Dreyne’s garden near her studio. It’s a mishmash of reclaimed doors, windows, and wood from a home renovation. The interior is filled with fun little items found here and there, like a chandelier and burlap draperies. 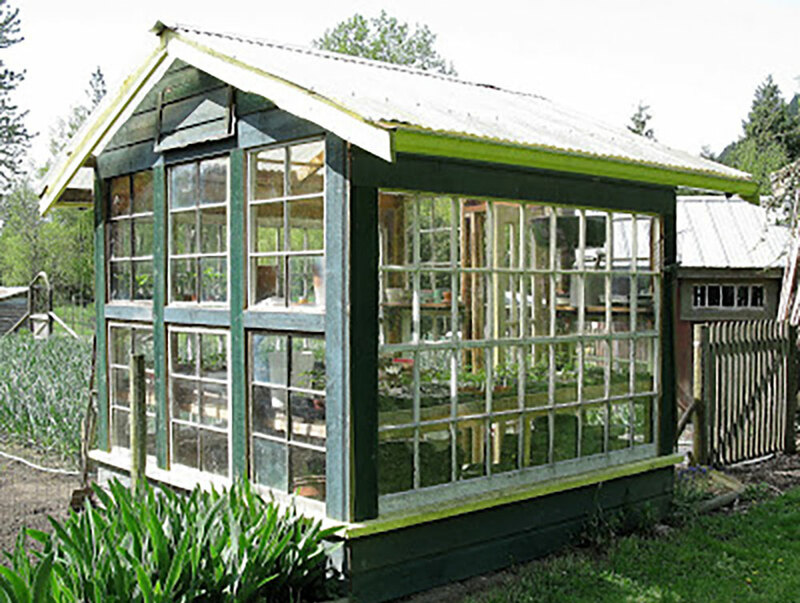 This cute little greenhouse sits in a yard in Harrison Hot Springs, BC along with an antique store and chicken coop. You can tell this was built to fit the windows, and it turned out perfect. See more photos of the property at Funky Junk Interiors. 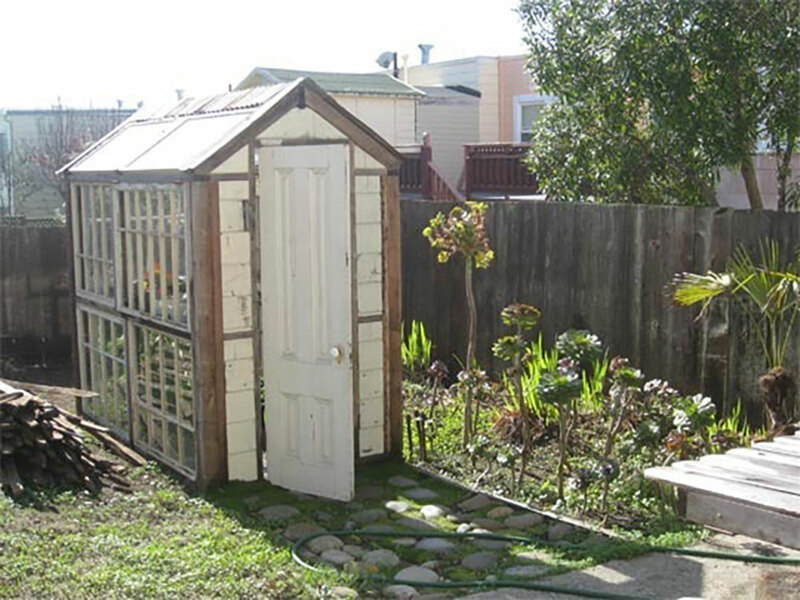 Here’s another DIY greenhouse from old windows we wrote about a few years ago. Cheft on Instructables built it using windows salvaged from houses being torn down in his neighborhood. He began by laying the windows out on the ground to plan out two equal sides for the walls, then used that layout to build the frame. 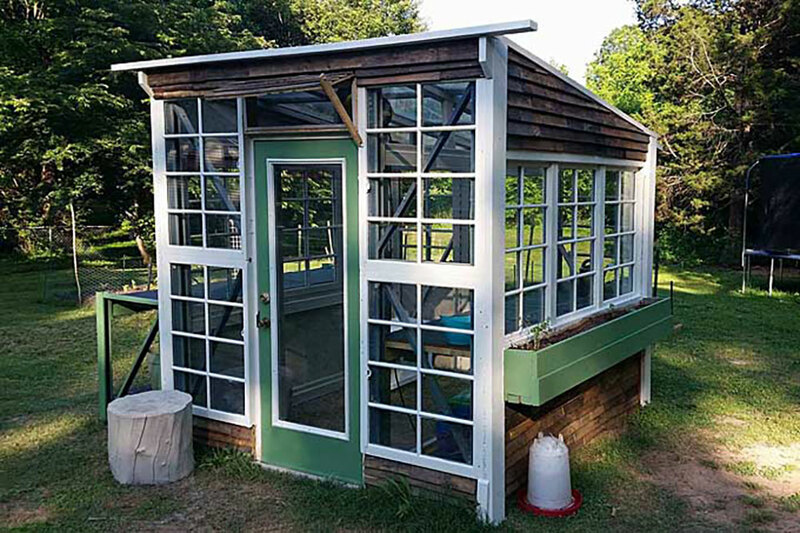 Using a collection of old windows and french doors, Linda J on Hometalk and her husband built this adorable little greenhouse for their garden. At night they light it up with icicle lights for a charming after dark garden space. 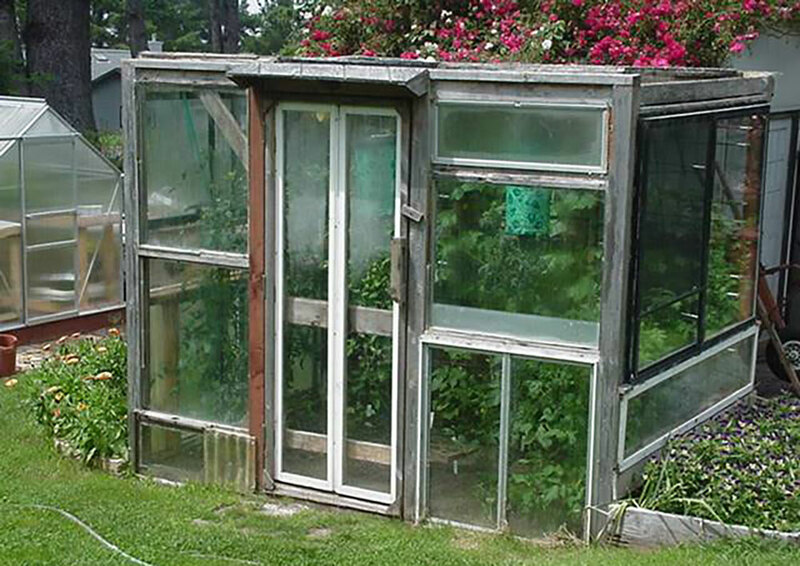 Javan on the Houzz forums shared this greenhouse he and his wife built using windows given to them by a neighbor. They use it to grow peppers, tomatoes, and climbing cucumbers. Like may people who build a greenhouse with reclaimed windows, they did not use plans to build this; rather, they built a frame to fit the windows they had. 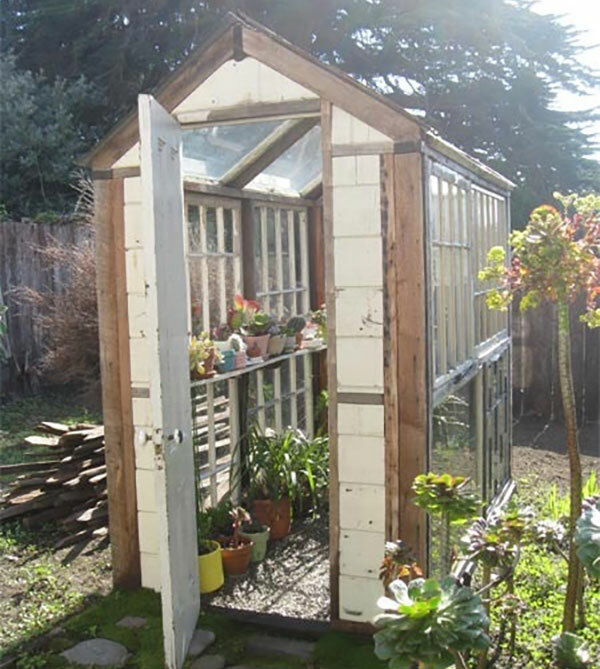 While using reclaimed windows for a greenhouse is great, using recycled framing materials makes it even better! 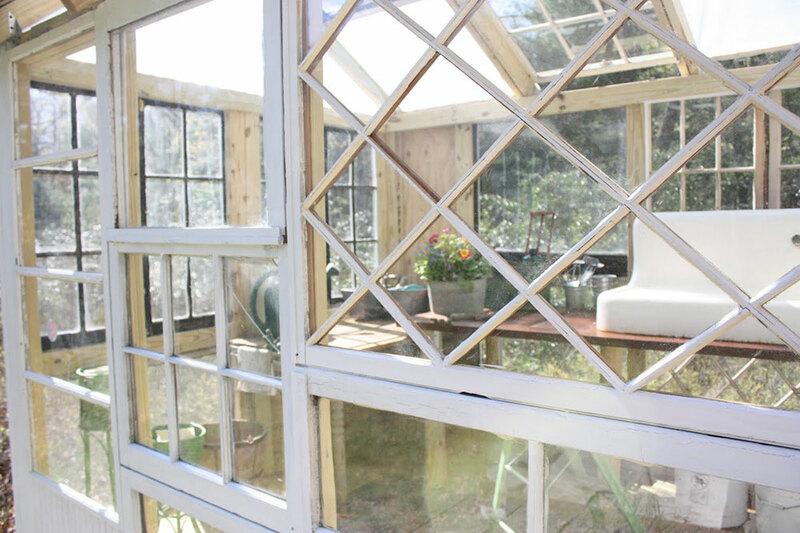 Jason Ellis of South Carolina used pallet racking he found for free on Craigslist as the frame for this beautiful greenhouse. The 1900s-era windows came from an old bank and many of the other materials were found for free. Read more about the build at Gardener’s Path. 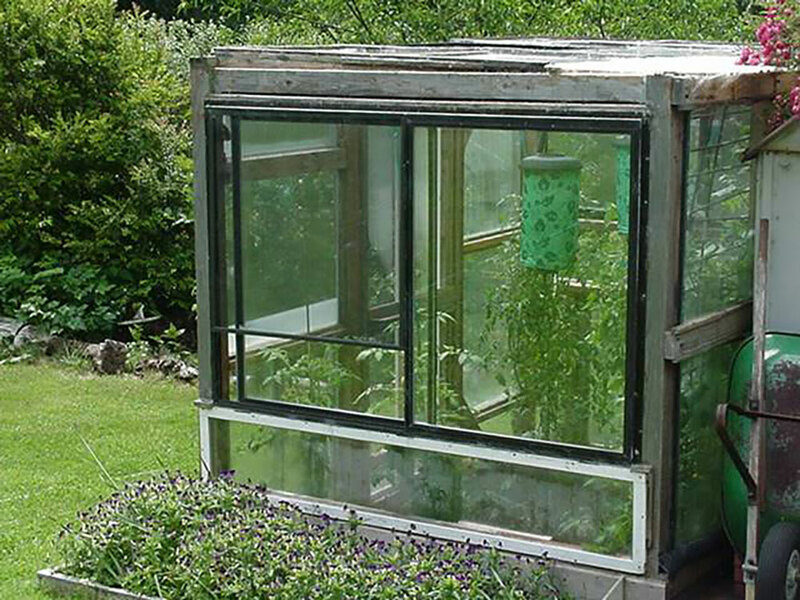 If building a large greenhouse seems intimidating, try your hand with a small scale version. 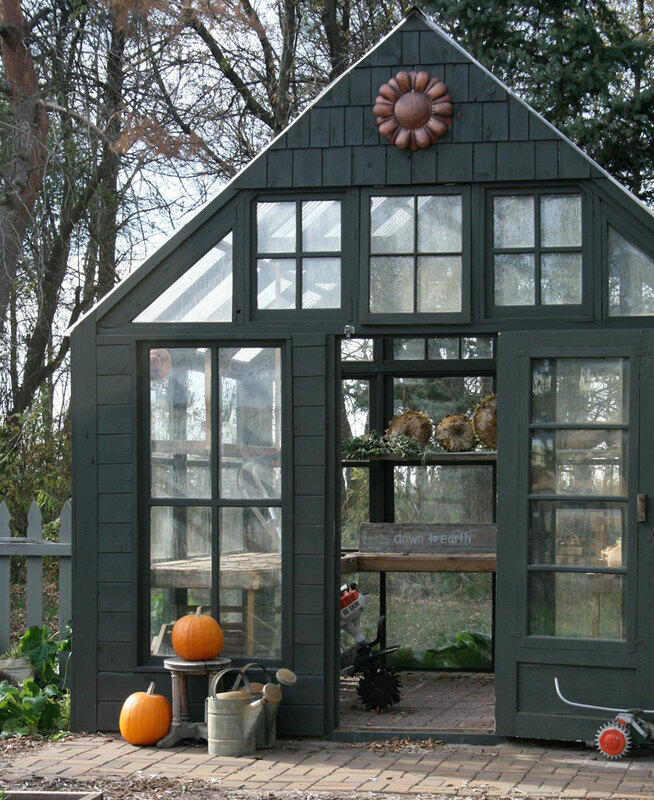 This cute little greenhouse in Ohio, posted on the Houzz forums, is a perfect example of a simple greenhouse design using old windows. The shutters make a nice finishing touch! Featured on Apartment Therapy, this gorgeous greenhouse sits behind the General Store in Santa Cruz, CA. The rustic building adds interest to a patio area and is filled with heat-loving succulents. 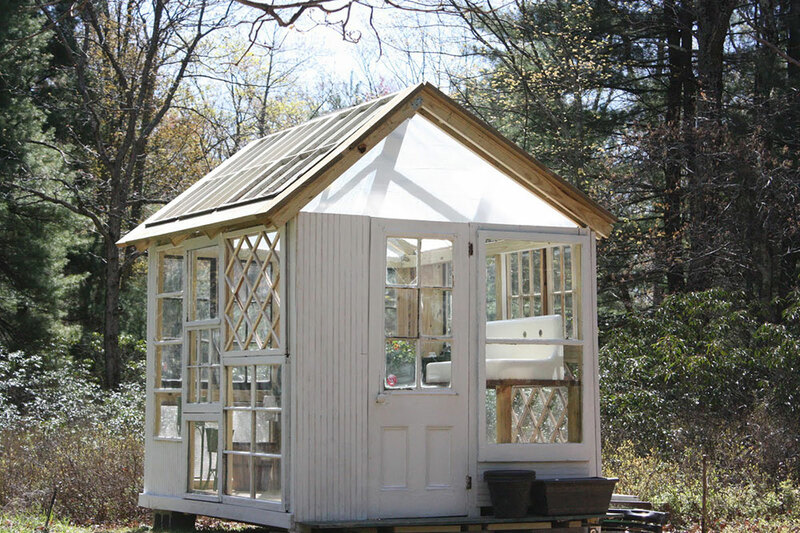 This greenhouse is absolutely beautiful, and it’s made almost completely from recycled materials! Stacey at Down to Earth Digs uses it to start seedlings every spring, and it shows up in many of her stunning garden images. 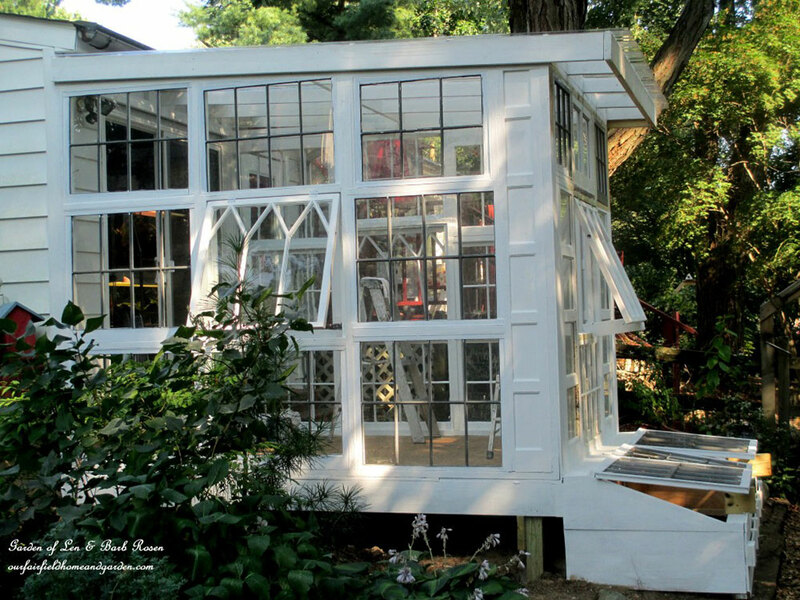 Her husband built it without a set of plans to follow, just creativity and ingenuity. Amazing! 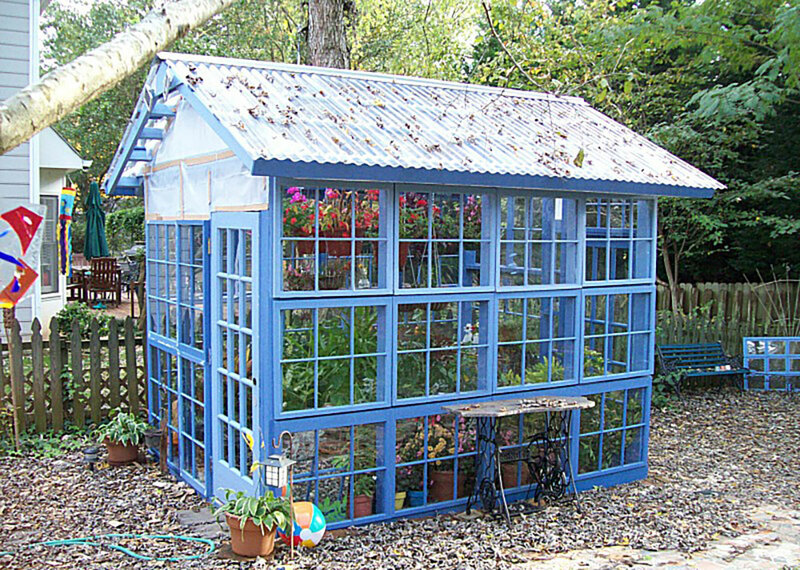 Lastly, here is a gorgeous greenhouse with an attached cold frame. 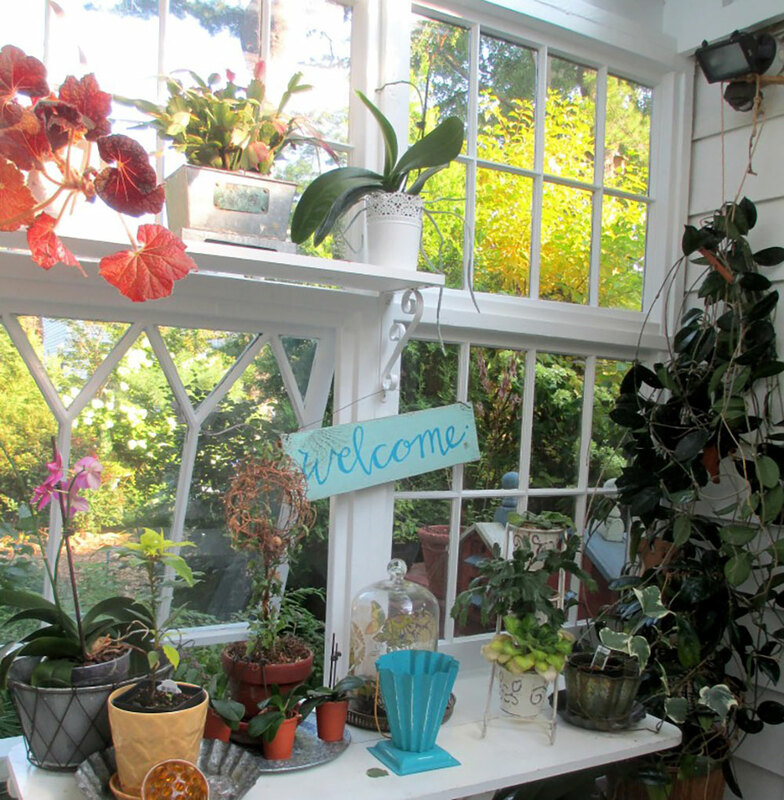 Barb from Our Fairfield Home and Garden found three antique windows at a yard sale and from there, an idea for building a greenhouse from old windows took root. 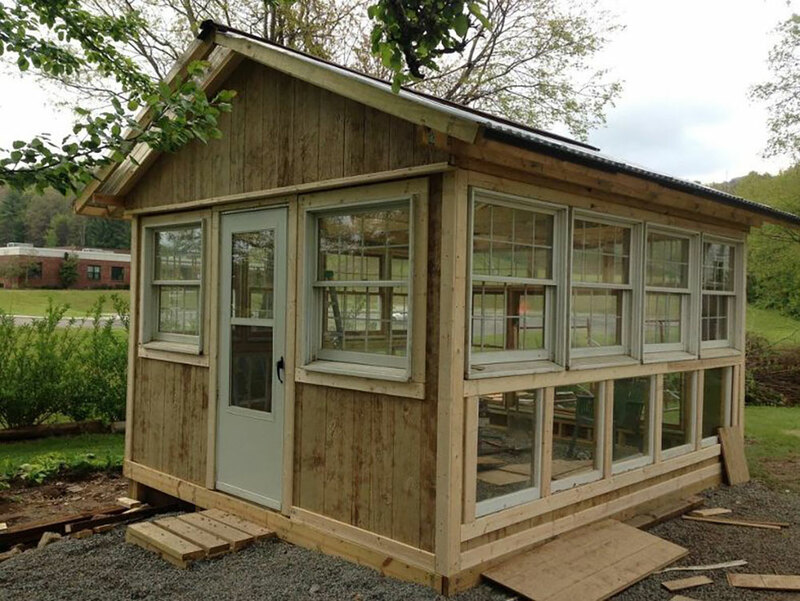 Barb spent over a year saving up salvaged windows before starting the project. As she was unable to do the labor herself, the biggest part of her cost was paying builders to bring her vision to reality. The result is every gardener’s dream!